Never in my half-century of studying plants have I seen what I saw on this morning’s dog walk. Bees were visiting and collecting pollen from bermuda grass! These must be desperate times for bees. 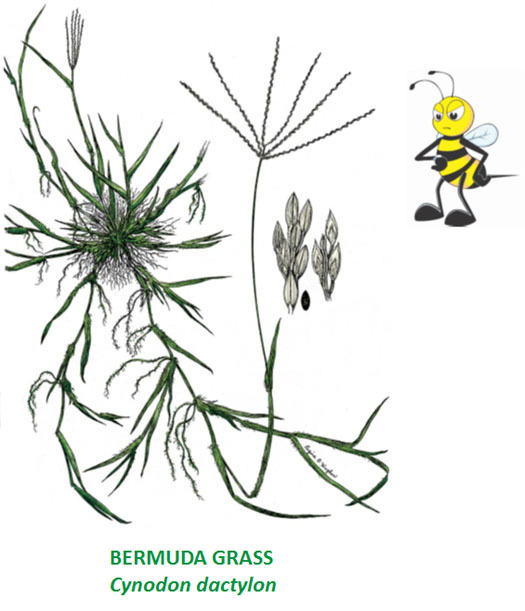 Bermuda flowers are not showy – no petals, no sepals. Most people wouldn’t even notice them. They have no nectar. When they bloom they release pollen grains that are so small and light that they get blown around in a light breeze. (Not a surprise to allergy sufferers, right?) They are supposed to be wind-pollinated. Bees are supposed to visit pretty flowers that have something to offer. This is what I learned in school, so it must be true. This is what I taught for decades, so it must be true. This is what I wrote in my textbook, so it must be true. Isn’t Mother Nature grand? She thumbs her nose at human knowledge about her. I think I’ll go get another cup of coffee and go outside and watch the pollination show. And be grateful that my neighbor hasn’t mowed his lawn in so long that his bermuda went into full flowering. Where would those poor bees have gone without him?